Freddie Mercury was the flamboyant, narcissistic, immensely talented frontman for the iconic British rock group Queen, who died of AIDS in 1991. 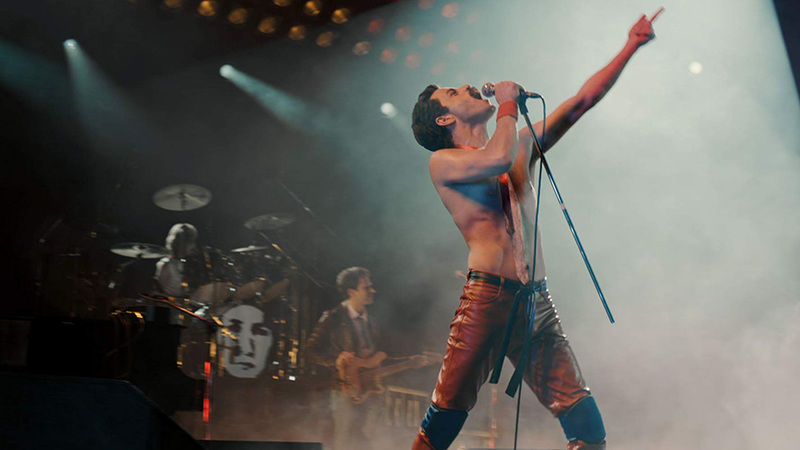 Bryan Singer’s new biopic “Bohemian Rhapsody” spans the career of Queen, with a sharp focus on Mercury’s life, from their conception in the early 1970s to their triumphant return to the stage during the Live Aid concert in 1985. While “Bohemian Rhapsody” hits all the requisite highlights of Mercury’s career, Anthony McCarten’s screenplay never gets inside the mind of Mercury to find out what made him tick. Much attention is given to the production of the album – Mercury listening to opera recordings as inspiration; bandmates Brian May, Roger Taylor, and Rick Deacon recording the “Galileo” section as Mercury works with the mixer technician to produce the exact sound he has in his mind. But what’s missing is how the sound penetrated Mercury’s mind in the first place. What was Mercury’s inspiration? What did the lyrics mean? Mercury sings, “Goodbye everybody; I’ve got to go; Got to leave you all behind to face the truth.” And, “I don’t want to die; I sometimes wish I’d never been born at all.” Lyrics this powerful and moving don’t belong on the big screen without some kind of explanation. Is Mercury embarrassed because his uptight parents don’t understand his desire to front a rock band rather than pursue “meaningful work?” Or is he foreshadowing his own death? Was “Bohemian Rhapsody” meant as some kind of gay anthem? These questions are simply never explored. We see Mercury writing the song, the band recording it, and in the film’s funniest scene, a record executive arguing vehemently with Mercury over releasing a six-minute song he fears no one will understand. And that’s exactly the problem with the film “Bohemian Rhapsody.” It sheds no light on Mercury’s lyrics, and therefore no light on Mercury himself. Oh sure, we’re privy to all the essential career focal points – the creation of the “We Will Rock You” audience-participation chant, Mercury’s discovery that he is bisexual, Mercury’s ill-fated solo career in the 1980s, and so forth – but this is the stuff of documentaries; Freddie Mercury’s life warrants a social worker or a psychiatrist. Singer’s film provides neither. Furthermore, many of the songs and career achievements are presented wildly out of order. For instance, we see the band creating the “We Will Rock You” chant (from their 1977 album “News of the World”) about twenty minutes after Mercury cuts his hair and grows the moustache he introduced in the 1980s. And once again, “We Are the Champions” (the companion piece to “We Will Rock You”) is often thought of as a gay anthem, yet its lyric content is never explored. In fact, it isn’t even performed in the film until the final Live Aid concert scene. And the most disappointing collateral damage of these continuity errors and failure to explore the mind of Freddie Mercury? American actor Rami Malek is absolutely fantastic as Mercury! Malek makes Mercury’s oversized ego and bombastic personality burst off the screen. We love and hate Freddie Mercury all at once, thanks to Malek’s star-making turn. When Malek/Mercury is on stage, he commands the attention of anyone watching. I am disappointed Singer’s film taught me almost nothing about the creative genius of Freddie Mercury. However, on the surface level of a scripted, biographical portrait of a rock music legend, “Bohemian Rhapsody” succeeds. I wanted – nee, expected – more. I wanted to know where Mercury’s musical inspiration came from; I wanted to know what his lyrics meant to him. But I will admit the finished product still looks pretty good.